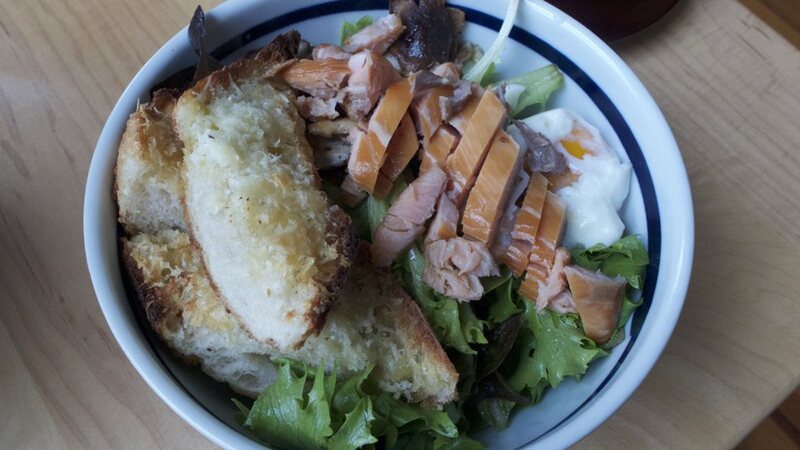 Mesclun greens, smoked salmon, shiitake mushrooms, and “ceviche” red onions; dressing: lemon vinaigrette; generous garnishes: a not-the-most-picturesque soft-boiled egg and several pecorino-romano croutons. The farmer’s market in a bowl. Boston’s harsh winters give way each year to summers and falls that yield fantastic, albeit transient, produce. During these warmer months, farmers’ markets operate all around the city, and vendors offer fruits and vegetables of every shape, color, and texture, from deep red strawberries (which have an extremely short season) to curly garlic scapes (the green stems of garlic bulbs that never appear in grocery stores) to tat soi (a spinach-like green that wilts down less during cooking). I always try to stock several types of lettuce—red, green, romaine, arugula, mesclun—throughout the summer for salads, both because lettuce is never better at any other time of the year and because the summer is hot (and salads are…not). In my typical salad-as-a-meal brainstorm, I aim for combinations of lettuces and extras that result in texture and flavor contrasts. Of all my mental models about food, I consider the category of salads to be one of the most amenable to delicious, formulaic variation. Dressings can transition from sweet to sour to savory by combining a subset of lemon juice, honey, soy sauce, miso paste, rice vinegar, sesame oil, olive oil, balsamic vinegar, anchovies, pecorino romano, goat cheese, salt, and pepper. Onions, apples, walnuts, pecans, almonds, bacon, and toasted baguettes all contribute a crunchy bite. Warm beets and poached eggs complement crunchy ingredients with textures that are firm, but yielding. I dreamed up the smoked-salmon-and-poached-egg salad shown above after visiting the farmer’s market and taking inventory of what I had in the refrigerator. The salmon came from the Boston Smoked Fish Company, the greens from Heron Pond Farm, the eggs from Copicut Farm, the shiitake mushrooms from Myco Terra Farm, and the bread from Iggy’s. I pan-fried the shittake mushrooms in butter and added “ceviche” sliced red onions to balance the richness of the smoked salmon, butter, and poached egg. To ceviche the onions, I sliced from pole to pole and then dressed the thin onion slices in lemon juice and salt for an hour prior to serving. My poached egg is not exactly the paragon of poached egg beauty (probably because I had not yet read J. Kenji López-Alt’s guide on poaching eggs), but it was delicious all the same. A simple olive oil and lemon juice dressing tied all of the ingredients together. Beet and goat cheese with Fuji apple slices, honey-lemon-candied pecans, baby greens, and balsamic vinaigrette. 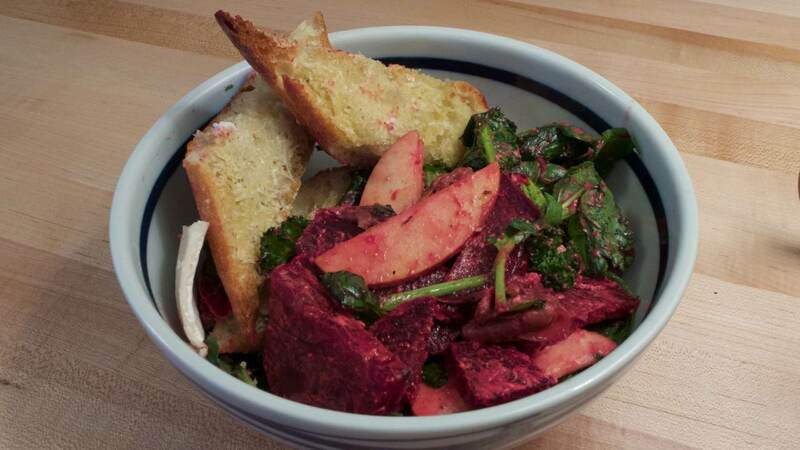 Warm beets melt the goat cheese, lending the balsamic vinaigrette a creamy texture. 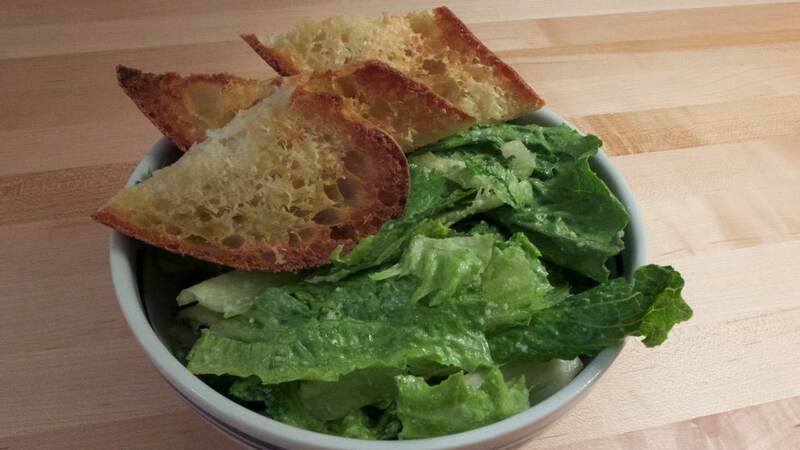 My favorite caesar salad, made with just romaine lettuce, baguette croutons, and a caesar dressing from anchovies, garlic, black pepper, lemon juice, pecorino romano, and olive oil. This salad is excellent even in the winter when the not-local romaine lettuce looks good at the grocery store. 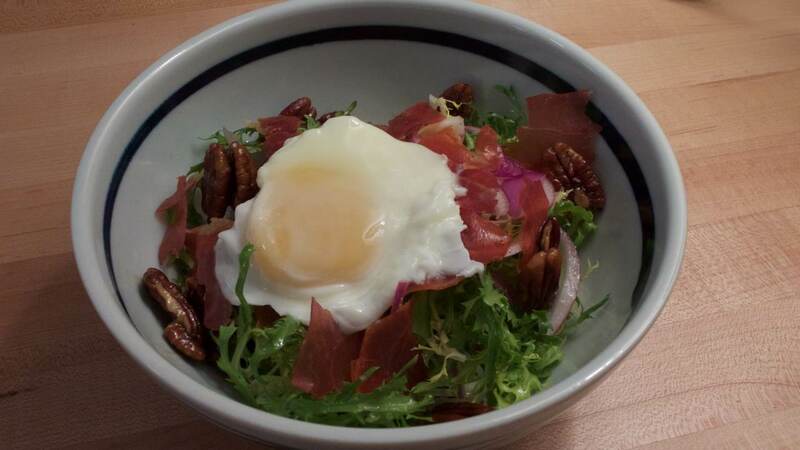 Toasted prosciutto, poached egg, candied pecans, ceviche red onions, and mesclun greens. After toasting, the prosciutto turns crispy and breaks apart easily. This salad is simultaneously salty, sweet, and savory.